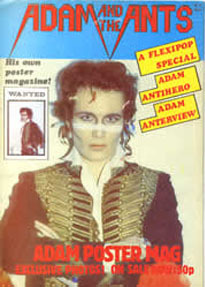 Adam Ant first gained public attention as frontman of Adam and the Ants, one of the most popular of the so-called "New Romantic" bands of the early 1980s -- and another of snake oil salesman/producer Malcolm McLaren's many projects. After the Ants dissolved in 1982 he continued for a while to be successful as a solo performer, as well as maintaining an acting career on the side. Both activities have since been seriously impaired by the singer's struggle with manic depression.